If you are interested in hunting Utah in 2019 or in the distant future contact Shane Scott Outfitting in Richfield, Utah. We provide a free Utah drawing consultation service. We can help you with future hunt planning and the Utah online drawing. We provide drawing and guided hunting services for mule deer, bull elk, cow elk, antelope, bison, rocky mountain sheep, desert bighorn sheep, moose, rocky mountain goat, black bear, cougar and wild turkey. The Utah online big game drawing is open now and closes March 7, 2019! For more information go to shanescottoutfitting.com, call or text Outfitter Shane Scott at Cell# 435-201-4088 or email at: shanescottoutfitting@hotmail.com. Good luck this year! Team SSO! f you are looking for a fun family or group elk hunt for the fall 2016 season look into a Utah elk hunting trip with Team SSO! Utah tags will go on sale over the counter July 12. Archery hunters choice spike-cow, rifle spike or muzzleloader spike bull. These are great youth hunts. 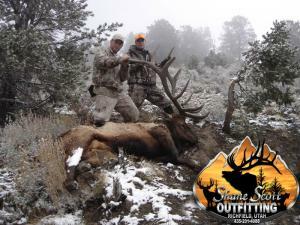 Call Shane Scott at Cell# 435-201-4088 or email: shanescottoutfitting@hotmail.com For more information. You can also go to: shanescottoutfitting.com. The Utah Online drawing closes March 3. Good luck to all! I live 2 hours from the Henrys. Assisted a hunter last fall take a 30 inch mule deer. It was a great time!